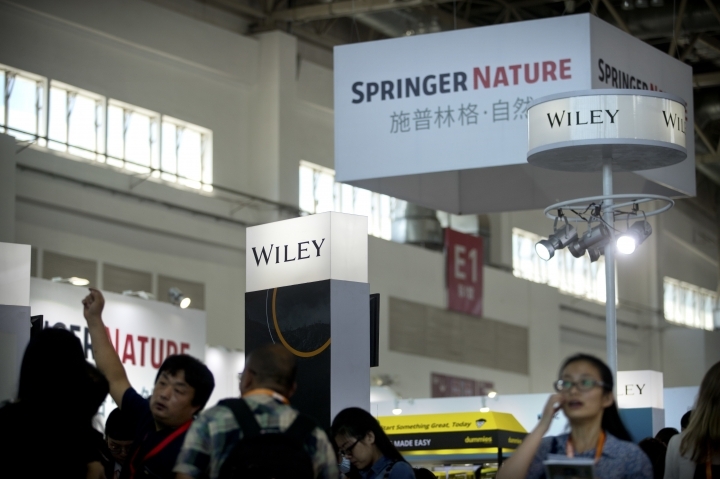 BEIJING — Academic publisher Springer Nature said Wednesday it has blocked access to articles within China to comply with demands from the Chinese government, amid a push by Beijing to tighten controls on information from outside the country. The company said in a statement that less than 1 percent of its content available online in global markets has been blocked in China in compliance with "local distribution laws." "This action is deeply regrettable but has been taken to prevent a much greater impact on our customers and authors and is in compliance with our published policy," the statement said. "This is not editorial censorship and does not affect the content we publish or make accessible elsewhere in the world." Springer Nature says it has published more than 275,000 books and 3,000 journals, including "Nature" and "Scientific American." The move is the latest example of how effective China can be at leveraging its economic might to compel foreign companies to make concessions in order to maintain access to its massive market. Chinese President Xi Jinping's government has tightened controls over information and over a wide range of groups that could feed opposition to the ruling Communist Party, including lawyers who take on sensitive cases, non-governmental organizations and churches. The blocked articles related to topics such as Taiwan, the 1989 crackdown on pro-democracy protests in Beijing's Tiananmen Square, the 1966-76 Cultural Revolution and the status of Tibet, which are considered sensitive by the Communist Party, according to a survey by The Associated Press. They can only be viewed with a virtual private network that allows users to skirt China's strict internet censorship regime, known as the Great Firewall. The newspaper Financial Times reported that at least 1,000 articles were blocked. In August, academic publisher Cambridge University Press restored more than 300 politically sensitive articles that had been removed from the publisher's website in China at the behest of authorities. Its action followed a petition circulated among academics calling on the university press to turn down censorship requests from the Chinese government. The temporarily blocked articles also touched on the Tiananmen crackdown, Tibet and similar topics. As of Wednesday, CUP's website, The China Quarterly, was fully accessible in China. Academics say that Chinese universities, which have long endured some degree of political interference, have also come under increased supervision, including regular monitoring in classrooms and ideological audits. Springer Nature said failure to block some of the articles as required by its distributors, who it said are the "officially appointed guardians of all content," could have led to its entire SpringerLink website being blocked. "Access to 99 percent of Springer Nature content is therefore safeguarded for all our customers in China and we will continue to work with the regulator and other Chinese authorities to minimize the content affected, reduce and ideally eliminate these restrictions on behalf of the global research community and wider society," the company said.